I don’t know why but in the past when I’ve tried to read Agatha Christie books I haven’t got on with then, despite loving the TV and movie adaptations I’d seen, or maybe because of them. However, I started reading some of the ones my parents have last summer and have loved reading them so I thought I’d try one of the ones I know better from TV now that the weather has improved and is better for sitting outside reading. 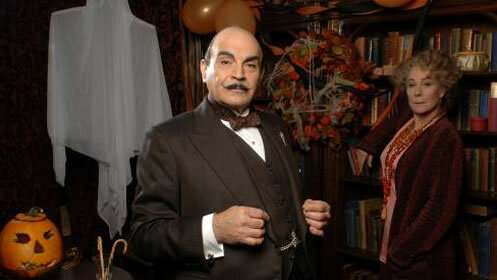 Hallowe’en Party is a Poirot story, I think he’s probably the most well known of Agatha Christie’s characters though I don’t know how well known her books are outside of the UK. It also has another recurring main character from the Poirot series in Ariadne Oliver, a crime novelist who comes up with unlikely answers to solve the crimes and is pretty much the opposite of the quiet, methodical Poirot when it comes to questioning. The book revolves around the murder of a young girl at a Halloween party whete Ariadne is a guest and so she brings Poirot in. This copy of the book was published in 1972 with this cover. I do like the cover art in this series of publications of the Agatha Christie books, this cover is by Tom Adams. The hand drawn or painted illustrations fit the story, or rather themes and elements that have an important part in the story even if they don’t seem obvious. This one is suitably creepy with the Halloween theme to the story. This isn’t a long read, at 189 pages it took two afternoons reading, maybe four or five hours, but it moves quickly with the story. There are no slow points as it gets straight into the story and introducing the characters within the first few pages. Although the majority of the story is Poirot investigating and questioning people, along with his own internal observations, it is done in a way that keeps you engaged and there’s enough intrigue and seemingly unrelated elemtns throughout that you didn’t really know who the killer is until it’s revealed. I think the fact that it’s broken up into shorter chapters, most are around ten pages in this publication, does help it move along as it gives natural breaks for changing the scene. It also means that you get natural break points if you want to put the page down and you can read it for shorter bursts if you want without it breaking up the story unnaturally. One thing I’ve noticed in these older publications is how the chapters sometimes break up the pages, rather than starting a new page. It’s just a style that seems to have been used a lot at the time but it does mean they can make the book shorter page number wise and makes it all run on rather than a visual break. The idea of the child’s murder and how shocked everyone is, along with the general theories of a stranger or serial killer which are touched on by the various characters when answering questions, due to the fact it is a child rather than an adult, do feel in some ways like they could be the reactions of people today. Despite the lack of technology and the dated way the characters speak the story itself has aged well, like a lot of Agatha Christie books, as it focuses more on the people and their reactions and motives rather than the settings, though the party at the beginning does describe quite a few party games that probably wouldn’t be done now. Having grown up in a small English village I have to say that some of the characters are recognisable in rural England today, even though the story us set fifty plus years ago. I think that fans of the ITV adaptation with David Suchet will enjoy this book, though if you’ve seen this episode it does mean you’d know the outcome before reading. Not that it makes the book any less enjoyable to me. The TV adaptation is true to the original story and it is hard not to see David Suchet made up as Poirot walking through the story and hear his voice in my head. This is one of those stories that, if I watched the TV adaptation, I would remember who had done the crime as soon as the character appeared on the screen. As it was when I was reading this I did recognise it a bit but it does have extra parts I didn’t remember being in the adaptation, maybe they aren’t there or I just forgot them, though reading Poirot’s insights and conclusions as he went through the investigation did add extra to the book and some parts were funnier than I’d expect from Poirot as he shoes from the outside. As far as Agatha Christie stories go this one is probably one I wouldn’t recommend for younger teenage readers, or not pre teens anyway. There are certain themes and ideas that are less family friendly than some of the other stories. This may sound weird considering all of her stories I know of are murders but there are different kinds of murder and, despite being set in a quiet village, there were definitely points in this book that I thought​ would either be harder for younger readers to understand or might not be suitable but it would all depend on the reader. I think fans of lighter murder mysteries woukd enjoy this, even if they have no idea about Agatha Christie or any prior knowledge of the Poirot characters. It is set in the middle of the twentieth century, I don’t think a specific date is said, so you do have the speech of the time and the lack of modern day technology but the story itself ages well and you get a nice setting in a small English village. The characters are well thought out and the story makes sense, even if it’s unpredictable until the end it doesn’t reference someone completely new and it all ties various loose ends together well. I think this could be a good book to introduce people to Agatha Christie and Poirot. It has complex stories that work together and moves quickly enough that it doesn’t have any parts that lose momentum. It may be fairly far in the Poirot series but the stories stands well by itself even while making some references to previous stories, they aren’t anything that you need to know for the story to make sense. Although this exact publication may be hard to find it has been published in so many different versions through the years and Agatha Christie in general seem to pop up a lot in charity shops and second hand book shops due to her popularity, as well as lots on eBay so it’s probably somewhere cheap if you want to check it out or your local library should be able to get it in as it’s one of the well known Poirot stories. It’s something I’ve noticed reading the older copies from my parents’ bookshelves that I didn’t really notice before. There are definitely some that are better than others and some of the storylines of the TV a series based on it kind of blur into each other but I’m enjoying the ones I’ve read recently.